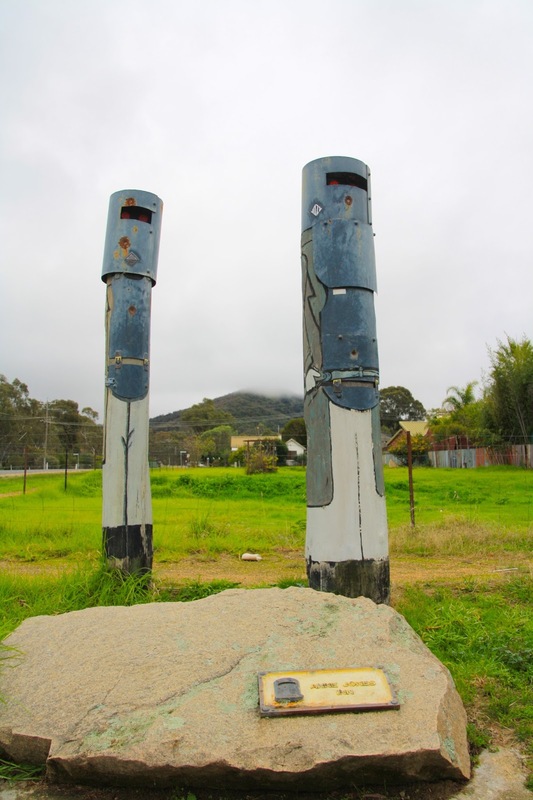 I do loves me some Ned Kelly history in the country towns I visit, and I have been to a few places that Ned and his gang spent time in. From Power's Lookout, where young Ned hid out with his mentor, fellow bushranger Harry Power; to Stringybark Creek, where three police officers lost their lives; to Old Melbourne Gaol, where Ned's own life ended; to the State Library of Victoria, where his famous armour is on display today. Glenrowan is another town that has Ned's name written all over it. Literally. It's the town where Ned was captured in 1880 and his bushranging days came to an end in a bloody gunfight. 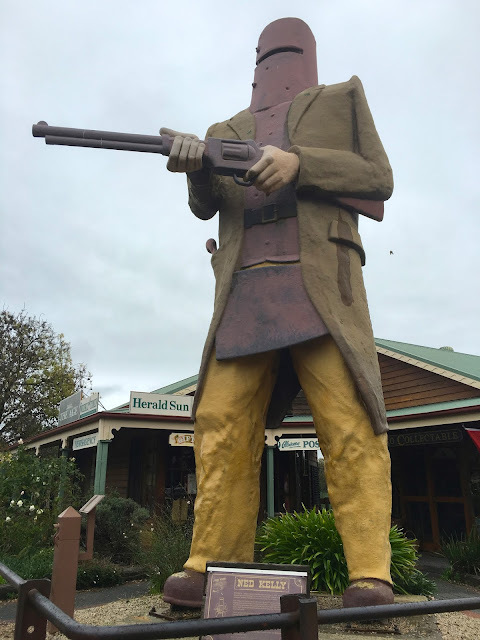 It's the town that has a Ned statue as big as a house in the Main St.
We started our visit to Glenrowan by going to Kate's Cottage. Once inside the shopfront, you exit out to the back room where the Ned Kelly Memorial Museum is located. It has photographic displays, memorabilia, replica armour and examples of pistols and handcuffs used during Ned's reign. Further outside, a replica of the Kelly Homestead, with rooms depicting life in the 1800's. Colourful gardens of succulents and flowers, wagon wheels and farm equipment were around the perimeter of the cottage. There's also a couple of talking cockatoos in a big cage on the side, their names are Howard and Dorothy. Tell them I said Hi! A couple of old doors from Pentridge Prison added to the decor, as did an old jail cell and convict cart. The museum was an interesting way to get up to speed on all things Ned. Armed with a walking map printed on the Museum brochure, we set off on the trail of Ned's Last Stand. 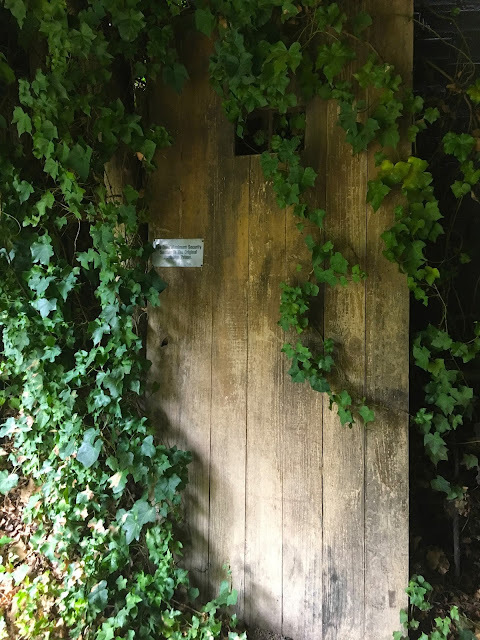 The Police Lockup from Ned's hometown, Greta, where Ned spent time as a teenager. Wooden bollards at each site represented the people involved at that location, like the police officers who arrived by train in the wee hours of the morning. Civilians were held captive in Ann Jones Inn, which was burnt to the ground during the seige. 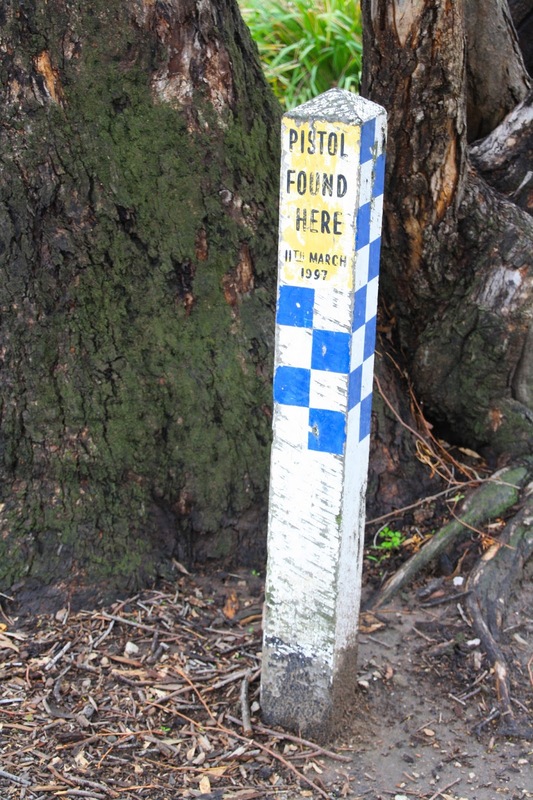 And over a century later, a pistol was found here, believed to belong to an Aboriginal tracker. The final site - where it ended, with Ned captured just after dawn. And so ended our visit, we bid farewell to these guys and headed home.